With the RBNZ yesterday confirming that they had intervened in the FX market to lower the value of the NZD, i thought it a good time to review the BIS Real Effective Exchange Rate data. Given New Zealand’s persistently lower rate of inflation, i was not surprised to see that the NZD REER (broad real effective exchange rate) has appreciated by less than the AUD, however i was surprised at the gap between the two markets. 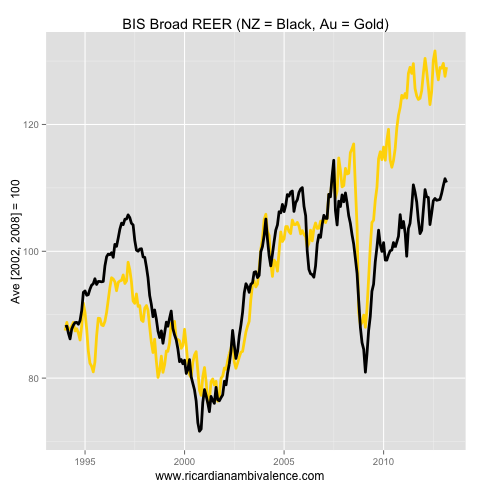 Relative to the average REER between 2002 and 2008 (inclusive, i chose these dates as they span a full cycle) the AUD is 29% higher, whereas the NZD is only 11% higher. This leads to interesting questions about why the RBNZ is selling FX. Part of the answer is that unemployment is high and inflation is low — and the other part is that the RBNZ are uncomfortable with the pace of house price appreciation. Thus, as they fear the financial stability implications of easing financial conditions via lowering their target overnight cash rate, they are attempting to ease them by lowering the value of the NZD. 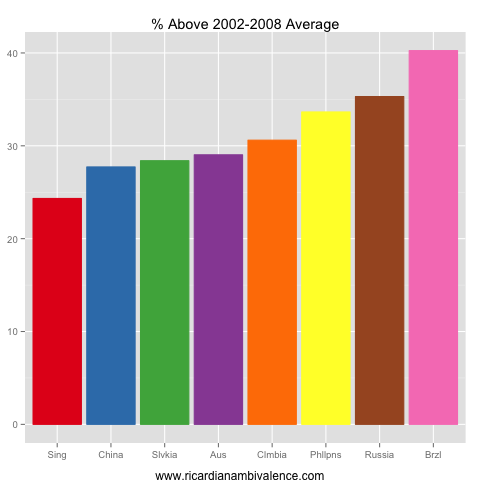 The top seven markets for REER appreciation (as measured by the percentage increase over the 2002-2008 average REER) are in the chart above. The largest REER appreciation, by far, has occurred in Brazil. Here, the authorities intervened to cap the BRL and (in a victory for economics) pushed the inevitable real adjustment onto domestic prices via higher inflation. So while the nominal increase in the BRL has been reduced, the REER is higher, and is now ~40% above the prior cycle average. It is a similar story for Russia (+35%). Australia is the fifth most impacted, with the REER ~29% above the cycle average; this is close to the ~27% REER appreciation in China. Given that Australia is well ahead of NZ on the FX-pain leader board, should the RBA intervene? I do not think that it would achieve all that much – the RBA might get a little more domestic inflation, but (like Brazil) it is unlikely to change the real FX story very much. So why is it okay for NZ? Their inflation target is 2% and they are stuck at 1% just now, so a bit more inflation would be welcome. It is not yet clear that the RBA has a problem with inflation being too low. We have had some low prints, but it is not yet a problem. This entry was posted in AUD, FX, monetary policy, NZD and tagged intervention. Bookmark the permalink. 16 Responses to Who’s winning the currency wars? …. and the funny thing is that the report has a significant margin of errors so we can expect ANY result really, for bulls and bears. All employment indicators have been very weak, so expectations must be for a weak report, but that does not mean much! The RBA cut was a surprise for markets, what did they know that markets did not? Nothing! We just got it wrong. I’m tipping a good number, but it’s a lottery. I curious to see how Aussie shares will react to a bad or good number. In case of bad numbers, but not too bad, I expect a small dip in shares, balanced by the fact that AUD would go lower too. A very bad number would probably send both south? Good numbers will push AUD up but shares…… down, I reckon! So not a good day overall for shares I think. A bit weak means lower rates and therefore higher PEs. Market has been rallying despite weak data and profit warnings — a bit scary? Or an adjustment to low rates? – or higher commodities to push miners up. That’s it. Otherwise we are at the top for a while. But since no one expects big falls, in the meantime franked dividends are better performing than term deposits. It could be boring and range trading in all assets until the Fed do something different. Shares jump just 10 min before release…. why? weak number upcoming? Employment surged last month by almost three times the long-term average, driving down the jobless rate and triggering a rebound in the dollar to where it was ahead of this week’s official interest rate cut. Anyway… did you notice the latest inflation in China ? Inflation +2.4% v exp of 2.3% & 2.1% in Mar. Mainly due to food (+4%) as non food inflation fell to 1.6%. PPI -2.6%. Core inflation is at 1.6% y/y — in China! Is there a single place in the world that is not experiencing disinflation, while central banks keep “printing”? I think this number is astonishing for an economy that needs to grow at 8%. It is not believable. I believe it. There is low inflation everywhere. CB reserve printing might not work as well as everyone thinks! Interesting: after good labor numbers, which I thought would send AUD towards 1.03, the AUD has been unable to hold on its initial gains (so far) and it’s back to pre-release as I spean (1.0192). Positive data from the US (the jobless claims) is actually weighting on AUD (and on Gold)! But AUD used to be a risk-on play? Is the tide really changing in favor of the USD? The AUD cash rate is now just few bps above the S&P 500 yield (2%) and the S&P 500 seems unstoppable. Early days, but ….. I hope you like your adjective this week. You are everywhere at once on economics!! I hope that does not mean all over the place!